With apologies to the flooring now weathered from hours of fraught indecisiveness, free agent forward Patrick Marleau finally settled on a new team Sunday night - the Toronto Maple Leafs. Marleau, 37, inked a three-year deal worth $18.75 million with the Leafs, who have now added three players 36 years of age or older to their roster in the last 36 hours. Marleau’s contract breaks down to $8.5 million the first season, $6 million the second and $4.5 million in the third, with a full no-movement clause. Nearly $15 million of the $18.75 million deal comes in signing bonuses. 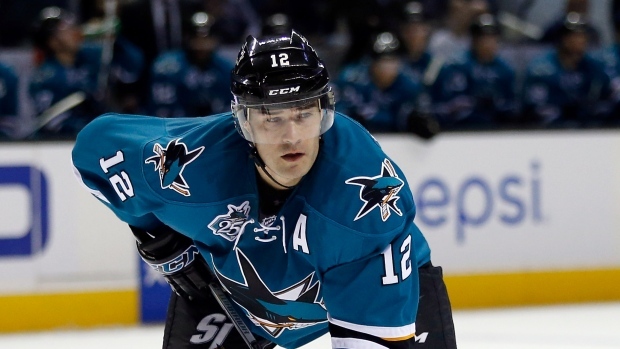 This will be the first time in his 19-year career Marleau has played for any team but the San Jose Sharks, who drafted him second overall in 1997. Leaving the Bay Area and moving to another country after a long tenure won't be easy for Marleau and his family. Marleau was among the biggest names not to sign Saturday on the opening day of free agency, deciding to mull his options among the four teams he'd narrowed his list of suitors down to. The Saskatchewan native, who can play left wing or centre, posted 27 goals and 19 assists in 82 games last season, including the 500th goal of his career; Marleau was just the 45th player in NHL history to hit the mark. Despite the milestone, it was Marleau's lowest point total in a full season played since 2001-02. Perhaps more than with other free agent signings, there’s much upside and downside to consider in Marleau’s deal for the Leafs. Toronto is taking a chance that a player in his late-30s (Marleau will be 38 in September) who commanded enough money to instantly become the highest paid player on the team will be worth that investment over a multi-year term. Toronto's front office has been creative with burying contracts of older players in the past, but Marleau is a piece the Leafs' coveted, and that they aggressively pursued even knowing what he’d fetch in a weak free agent class. And making a sizeable chunk of Marleau’s salary out in signing bonuses could make him easier to trade in the final year of his contract if necessary. But for better or worse, the Leafs are thinking about the now - and their five-year rebuild plan seems all but a thing of the past. In that case, Marleau may not be the worst player to gamble on. He’s versatile and incredibly durable, having missed just 31 games over 19 seasons and none in the last four. While his production total last year was low by his standards, it was a down year for the Sharks as a whole coming off a Stanley Cup Final run the season before. There’s also Marleau's relationship with head coach Mike Babcock, dating back to two gold-medal winning Olympic stints in 2010 and 2014. General manager Lou Lamoriello said in comments provided to the media Sunday that the entire coaching staff was “in total support” of the signing. But Lamoriello spoke on Saturday about the importance of the Leafs improving from within, and to do that the young players need opportunity. Bringing Marleau into the fold gives the Leafs an excess of veteran forwards, and keeping all of them would impact the ability of some impressive younger skaters - especially wingers like Kasperi Kapanen, Nikita Soshnikov and company - from getting ice time they need. Knowing all that, the Leafs were zeroed in on Marleau from the beginning, which seemingly makes other forwards already on the roster expendable. James van Riemsdyk and Tyler Bozak both have one year left on contracts that will leave them unrestricted free agents next summer, able to walk away for nothing. Adding Marleau gives Toronto some flexibility in using either player as a trade piece to bolster their defence without losing a competitive edge. The Leafs are currently $2.4 million over the salary cap with Marleau, and still need to sign restricted free agents Connor Brown and Zach Hyman. They can be 10 per cent over the $75 million cap until the start of the season, when they must be compliant. Lamoriello was also careful to point out in Sunday’s comments that Toronto didn’t give up any assets for Marleau, it added “support” for the players already there. Like Saturday’s signings of Ron Hainsey and Dominic Moore, Marleau brings a leadership dynamic the Leafs prioritize - he’s played 1493 regular season games in his career, and 177 more in the postseason, plus he spent parts of five seasons as captain of the Sharks. As to where Marleau might fit with the Leafs, one option could be the left side of Auston Matthews. The Leafs play fast, and the prospect of Marleau replacing Hyman on Matthews’ line with William Nylander is intriguing, although hardly a sure thing. Even at his age, Marleau continues to showcase the speed and skating that’s helped define his offensive career. He has a good touch around the net, and playing with a centre like Matthews - a natural playmaker with as many goals as assists throughout his career - could be a strong partnership. Interestingly, Marleau played his first NHL game on Oct. 1, 1997, two weeks after Matthews was born. Among the youngest teams in the NHL a season ago, the Leafs’ attracting seasoned - and coveted - talents who profess to want to win now is indicative of how the outlook on the club has changed in just 12 months. The Maple Leafs were a surprisingly good team last year; they won’t be surprising anyone, including themselves, anymore.